Farm Fresh Eggs, Every Day! Every morning, I wake up and think about breakfast. It’s my favorite meal of the day. Think about it, Breakfast! Savory, sweet or both! You can have just about any combination of starch and protein, vegetable and fruit to complete your morning meal. When I think breakfast, I think poached eggs on any kind of starch I can get my hands on. English muffins from Model Bakery complete a sinfully delicious egg. 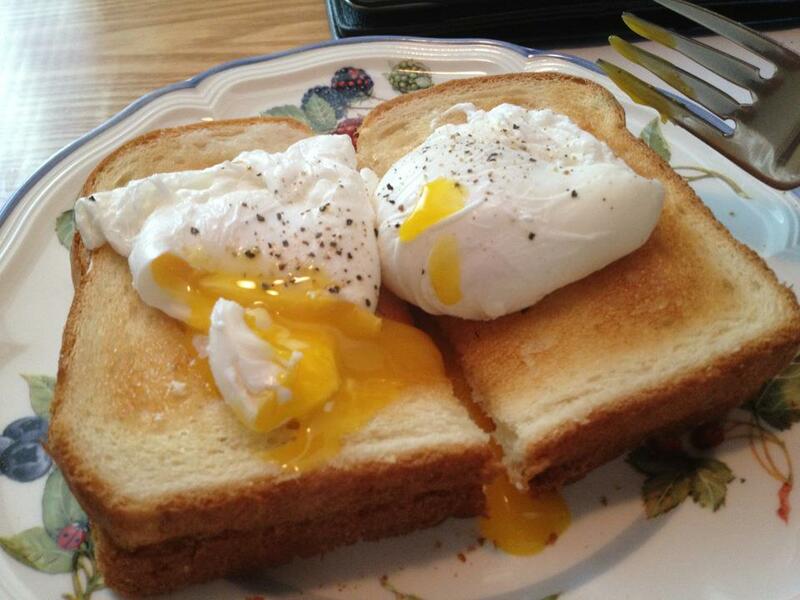 Just one farm fresh poached egg will win over anything else in my breakfast repetoire. Our farm has 150 chickens, laying more and more eggs every single day thanks to our uncharacteristically warm weather. Each egg is hand collected, washed and packaged in a cardboard carton. Eggs have always been a breakfast staple, and when I set out to write about our eggs and how wonderful they are I realized most people may have never experienced the amazing difference in taste between a farm fresh pasture raised chicken egg verses a commercially raised chicken egg. The difference is vast, and I’ll explain why. Pastured chickens are allowed to roam freely. Without concern for cages, the hens can peck and eat anything they get their beaks around. This includes bugs, weeds and the grape leaves growing over the top of their pen. With a varied diet, the chickens produce a healthier, more flavorful and deeper yellow yolked egg. I get so incredibly egg-cited (oh, I had to put one egg pun!) when I break open an egg, and the yolk is deep orange. It may not have any thing to do with the nutrition value, but the deep orange yolks have this creamy, buttery and lush texture not typically afforded to commercially produced eggs. Clearly, I’m passionate about my farm fresh eggs. I know you’re thinking, “This chick is crazy about eggs! What’s the big deal?” I’ll let you in on a little known secret. The good karma from purchasing your eggs from a local farmer is two fold. First, you’re supporting local farmers, which is a BIG DEAL. Second, you’re feeding your family a more whole food, with scientifically proven health benefits. In just two eggs, you can satisfy your daily requirement of vitamin A! Spring is the best time to try our eggs! The hens are happy, due to the plethora of sunshine, all the new vegetation and bugs galore! A nutritious diet with many variations is good for humans, and the same goes for hens. Hurley Farms has had chickens for 17 years. Periodically we’ll raise chickens from chicks to adulthood for various other farms. We also supply the ubiquitous Napa restaurant, Pearl with their eggs. Our egg selling hours are Monday through Friday, 10am – 4pm. You most certainly may call ahead to make sure we have eggs for you to come pick up! This does not come without a warning: Our eggs are so tasty, you’ll never want to buy grocery store eggs again! I’d like to thank you in advance, for your interest in our family owned and run farm!